This week's theme is "twigs" and for my earrings I decided to use actual real twigs! I went for a southwestern style and decorated the twigs with hemp and seed beads and then I wired on a pair of my stamped pony coins. Perfect for this horse-loving girl! Lady chowing down on green grass in the early morning sunshine. Steamy Strider—I love this photo of him! Check out the Flickr pool here to see what everyone else mixed up for week thirteen. See you next week with another pair! I love springtime! I'm always amazed at how green and colorful everything becomes after being so drab and brown for months. I could easily spend all day outdoors enjoying the beauty of the season! For this week's earrings I picked an apple blossom, carefully made a mold with it, and cast some new earring drops in a light green/gold polymer clay. After they cured, I added a black patina and put them together with antique brass wire and two little carnelian coins. Check out the Flickr pool here to see what everyone else mixed up for week twelve. "Sleepiness in the Woods" goes to kermie-girl! "Sunshine and Rainbows" goes to MeridyM! And "Pretty Ponies" goes to Moobie Grace! Yay! Congratulations ladies! Please contact me with your mailing addresses and I'll get your beads in the mail! It's painting day again! Actually, in my studio it's painting day almost every day! But today, instead of sleepy critters, I'm painting rainbow hearts and roses. The colors are bright and splotchy right now. I call this the "ugly stage"! Beautiful ceramic beads from Gaea Cannaday. I won them in the Feb ABS Challenge. 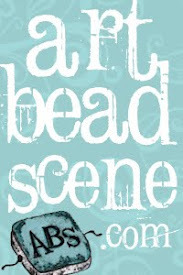 I don't have many art beads in my stash (that is something I plan on changing this year!) so I can't wait to play with these! This lovely bracelet is from the uber talented Tania Spivey. She made it with the leftovers from her Bead Soup and then held a giveaway. I still can't believe I won!! It's an amazing thing to hold another artist's jewelry in my hands and to see all the love and attention to detail put into it. And what makes this bracelet even more special to me is the polymer focal Tania made. I love the cute little flowers she makes! And the little copper flower charm is so sweet too... one of her very first I think. Yep, I totally love this bracelet! My very first Lorelei Eurto necklace! 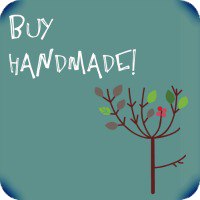 If you don't know who Lorelei is, then you must go here to see the lovelies she makes. She's got asymmetry down to a science! This necklace is also a Bead Soup creation. And from the moment I first saw it I just had to have it. It's totally me, and brings to mind my very favorite time of year when the leaves glow bright and there's no sound but the soft patter as they lightly touch the ground. Lorelei was so sweet to swap it for some of my beads. (She makes awesome things with my beads!) She says she's not sure why she stamped the word "quiet" into the center of the wire wheel... I don't think any other word would have suited it... I love it! ...and that's all for now! Thank you Gaea, Tania, and Lorelei for my new treasures! 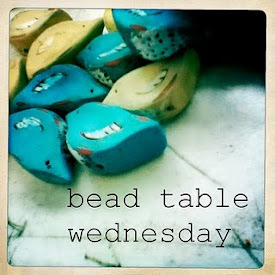 And thanks to you all for stopping by on this Happy Bead Table Wednesday! 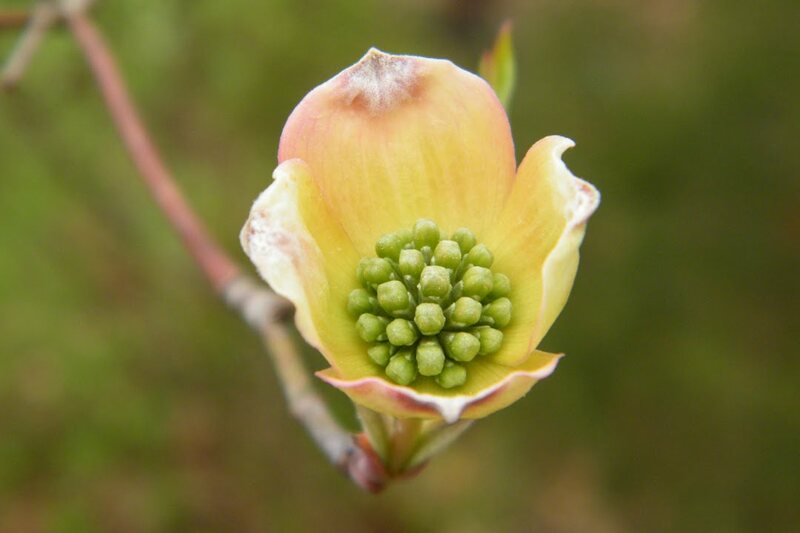 It's time to get out and enjoy the sights of spring! I'd almost forgotten it was spring-time—with the temperatures what they've been, you'd think we'd skipped right to summer! But the flowers know what season it really is and are putting on quite a show, so I happily spent a little extra time appreciating the gorgeousness this morning. Little Pepper is enjoying the beautiful warm weather too! 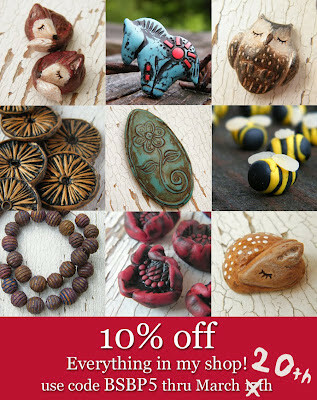 And don't forget about my bead giveaway and sale! They both end at 11:59pm EST tonight. You could win one of these! 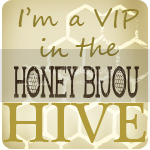 Go here for more sale details and to enter my giveaway! 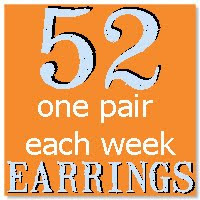 When Anke upped the challenge for the 52 Earrings group this week to using Spring as our theme for our next earrings, I knew right away I wanted to make a pair of earrings to coordinate with my Butterfly Dreams necklace I made for the Bead Soup Party. I started out by sculpting a few flower designs, but all of them met the same end... and were smushed. I just wasn't in the sculpting mood. I dug through my box of molds and found one I had made a long time ago, but had never used. It was a simple flower button. And what made it even better was it was a mold from one of my Great Grandma's buttons. In my button stash I found two mother-of-pearl buttons that were also her's. How perfect! First the necklace made with her butterfly buttons (that I'd been hording for ages!) and now more buttons to make coordinating earrings! I cast my new buttons in a dark pink clay and gave them each a shabby white patina. And then I paired them up with the mother-of-pearl buttons, peacock pearls, and antique brass. Cute and spring-y and the perfect pair of earrings to wear with my necklace! Check out the Flickr pool here to see what everyone else mixed up for week eleven. Hi all! It's giveaway time!! I've got three assortments of beads up for grabs for three winners... and yes, this giveaway is open to everyone—international bead lovers too. 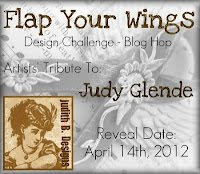 becoming a follower of Tree Wings Studio, posting about the giveaway on your blog, sharing it on facebook, and tweeting it on twitter. Winners will be announced on the 22nd. Check out the Flickr pool here to see what everyone else mixed up for week ten. A big HUGE thank you to every one of you for all the fabulous, uplifting, and just plain-old-super-nice comments! You guys are totally awesome!! 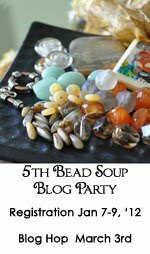 I had so much fun with my first bead soup party... I'm definitely marking my calendar for the next one! And yes, I'm one of the ones still hopping. If I haven't gotten to your blog yet, I will. I want to see everything! It's time for the reveal!! Pam Hurst sent me a fantastic assortment of beads... all very, very different from what I normally use and at first I had a lot of ideas of what I wanted to make, but one, by one I decided against them and to say I was stumped would be an understatement. Silver is not an easy metal for me! And all the beads together had such a nice classic look that I'm not used to. Pam really couldn't have done a better job choosing what to send me!! Finally, after many retries, I settled on an idea I had thrown out at the very beginning and tried for a western style using the pendant and clasp. I added some braided micro suede around the pendant—I wanted to frame it and really show it off. It's oh-so dainty and pretty and I didn't want the large pony beads to overpower the design. From there I strung silver beads, wooden beads, the smokey topaz, black onyx, and two faceted carnelians. The little ponies are my newest style of pony beads. I sculpted them in ivory polymer clay and decorated them with an orange inlay. And finally I ended the necklace with the sterling toggle and some red aventurine chips. This time I went in a totally different direction, a little closer to my comfort zone using antique brass, but to keep with the idea of trying new things, I chose to go asymmetrical... I think this is only the second time I've tried it. I used the labradorite and jasper from Pam and added in some frosted glass and agates. The abalone butterflies came from my Great Grandma's bead stash years ago and have been sitting in my bead box waiting for something special so they could come out of hiding. They are just perfect with the labradorites! I embellished them each with brass bead caps and a Swarovski crystal bicone from Pam. And for the closure, I used seed beads and a frosted agate capped with brass. And so, I used a little of everything (except the coral, but I have plans for that coming up very soon) and really did step out of my comfort zone and I discovered that stepping out once in a while really can be so enjoyable! Thank you all for stopping by! Thank you Pam for the most fabulous soup! And thank you most of all to awesome Lori for pulling this all together!! It has been so much fun! And just to say thanks once more, I'm running a special in my shop starting today and continuing through March 17th 20th. 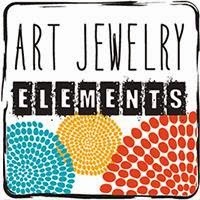 Take 10% off your entire purchase! And now, I'm off to start hopping! 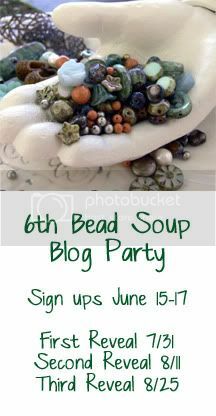 We're just a short while from the Bead Soup Party reveal (yay!! ), so this week's earrings are another quick pair. They're made up of new red flower links, spotted blue and black ceramic, antique brass spacers and caps, and red rondelles. Check out the Flickr pool here to see what everyone else mixed up for week nine.